Olympic eventing veteran Boyd Martin has announced his retirement from the sport in order to focus on an even bigger challenge: training cats. The 38-year-old rider and well-known feline fancier said while he loves his sport, after a Pan American gold medal, two world championships and two trips to the Olympics he’s finally ready to pursue his childhood dream. His interest in kitty athletics was reignited when he found a long-lost video compilation of himself training his childhood pets. The Chronicle has obtained a copy of this rare footage, and you can see his talent extends beyond the galloping lanes. Martin, a longtime member of the United States Cat Dressage Federation, has already been checking out cat agility competitions and begun the process of converting parts of Windurra, the farm where he and his wife Silva Martin live and train, to meet the International Cat Agility Tournament standards. The hooks in Boyd’s tack room at Windurra that once held bridles and girths now hold Swarovski crystal-encrusted collars and skeins of yarn, and the water complex is now populated by koi. The log jumps have been turned into scratching posts, and the rolltops have become sunning spots. His sponsors have had mixed reactions. Purina is staying on through the transition, though Attwood Surfaces is bowing out as Boyd has announced his plans to convert his jumping ring into a giant litter box. (Cats prefer to jump on the grass, most similar to the astroturf upon which agility cats compete.) SmartPak is on the fence. Though they have some products for cats, they don’t yet have a full feline division. “I’m really excited about the prospect of not breaking any more bones whilst competing, and I’m really hoping my son, Nox, will follow in my footsteps,” said Boyd. Boyd has been experimenting with training his current cats, Manny Pacquiao and Kostya Tszyu, but as they’re now 7 years old, he’s looking for investors to join MeowMeow Syndicate to invest in Bengal kittens, the breed most suited to agility. Silva, however, isn’t as thrilled. The dressage rider has taken over the ride on Boyd’s horses for the time being, to see which can swap full time to her sport. But that’s not the problem. 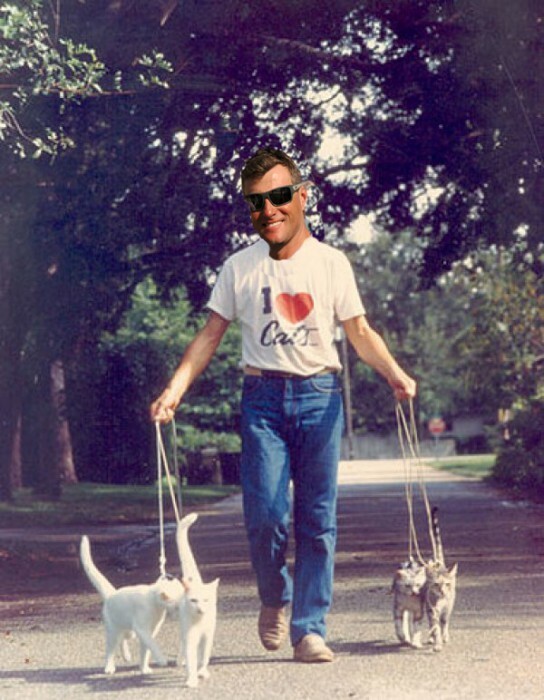 Boyd Martin announced he’s giving up horses to focus on his childhood dream: training cats.